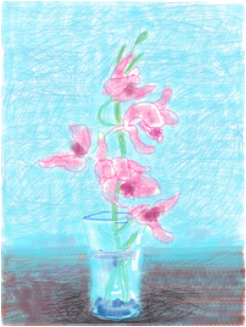 Art by David Hockney, created on an iPad. I am thrilled to be part of the Benton Middle School Visual & Performing Arts Academy staff, and honored to serve as the Assistant Principal here at Benton, The World's Greatest Middle School! I hold a GATE Specialist Certificate and have taught Language Arts, Social Science, and the French elective here at Benton. Go to my LINKS page or click here for GATE or 6th Grade Science Camp.